This family favourite with best chipolatas wrapped in dry cured bacon is perfect for chilly evenings. Preheat the oven to 220°C, gas mark 7. 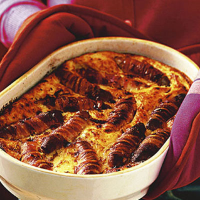 Wrap each sausage tightly in a slice of bacon and arrange in a large roasting tin or ovenproof dish. Lightly spray with a little olive oil and bake for 15 minutes in the oven until just beginning to brown. While the sausages are cooking, make the batter. Mix 150ml milk with an equal amount of cold water. Sift the flour into a bowl. Make a well and then pour in the eggs and gradually beat in half the milk and water with a wooden spoon. Beat well for 2 minutes then gradually add the remaining liquid (use a whisk to remove any lumps) until you have a smooth batter the consistency of single cream. Season with freshly ground black pepper. Remove the sausages from the oven and quickly pour the batter over them. Return to the oven and cook for a further 30-35 minutes, or until the batter is well risen and golden brown. Serve the toad in the hole straight from the oven with the hot gravy, creamy mashed potato and sautéed leeks. For extra flavour, add slim wedges of red onion and sprigs of fresh rosemary to the roasting tin when you bake the sausages.